Princeton Keynes provides unique materials and technical processes that deliver unparalleled performance in infrastructure applications. These are based on novel resin systems, reinforcing matrixes and specialized composite constructions. Princeton Keynes has been involved in highway and bridge restoration projects utilizing cutting-edge composite materials and processes. These include epoxy-infused carbon and Kevlar® fiber reinforcement technologies that return structural components to original rated capacities. 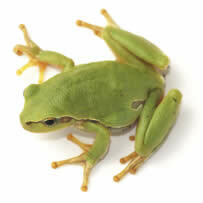 In addition, they provide superb corrosion and weathering resistance to applied structures. Princeton Keynes works on the composite reinforcement and restoration of a highway bridge overpass. The bridge support columns are being reinforced with carbon and Kevlar® fiber that has been vacuum infused with proprietary epoxy resin technology. Providing an extremely durable surface, the 100% solids thermosetting polymers utilized in this process also completely top seal the substrate. This prevents water/fluid migration through the surface and consequential spalling of the underside. A fiber-reinforced polymer overlay system is put down on a bridge deck overpass. The polymer system seals the deck and provides an extremely durable, impact- and corrosion-resistant roadway surface. Princeton Keynes has a unique patching compound that utilizes ceramic microspheres combined with an extremely strong and impact resistant dual component epoxy system. It’s thick, thixotropic rheology makes it an excellent patching and fairing compound that stays put and hardens to an extremely strong and durable matrix. When cured it looks like concrete but has the strength and durability of epoxy. In addition, the microspheres lower the density and provide impact and enhanced corrosion resistance. Ask about our new prototype system now being developed for underside bridge/overpass deck sealing and patching. This system delivers cure speeds measured in seconds as opposed to hours. 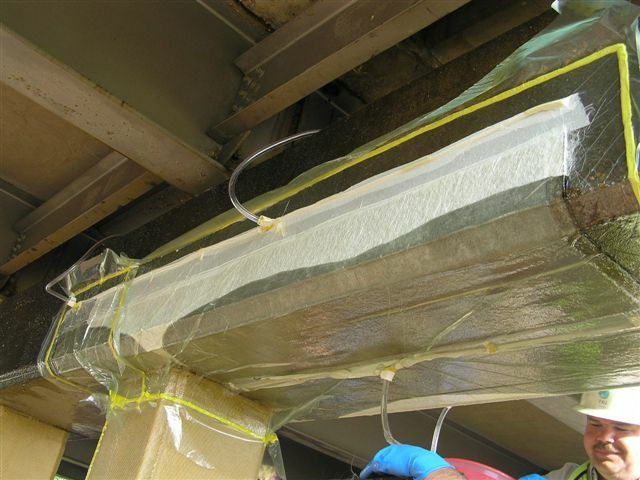 It can be utilized to completely seal the underside of a bridge deck or overpass to protect it from spalling and cracking for years. 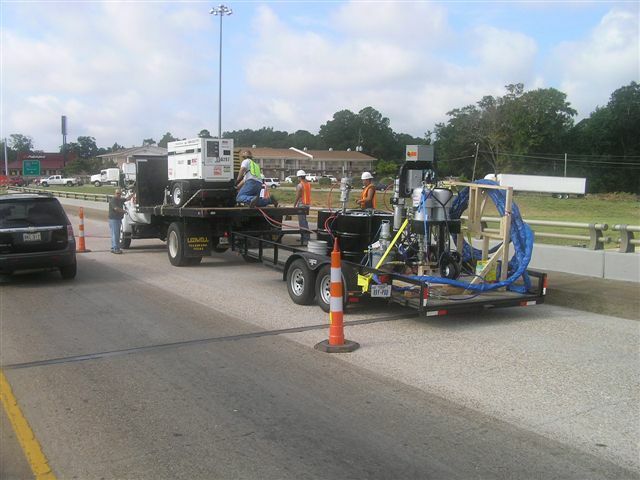 Because the installation is so fast it almost eliminates the lane closure and traffic control costs of conventional systems. Princeton Keynes provides cutting edge composite wrap/reinforcement technology for use on telephone/power transmission poles. This polymer matrix delivers three to five times the tensile strength of wood and can be used as a repair or reinforcement mechanism. All wood utility poles reach a point when they are no longer suitable either through damage, abuse or decay of the wood. New poles receive a preservative treatment to help prevent this decay. However, as a pole ages the original treatment becomes ineffective. The affected region most often occurs within an area on the pole extending about two feet above and two feet below ground level. Replacement is expensive and difficult, especially in the inner cities. Moreover poles treated with preservatives, creosote and pentachlorophenol, are impacting landfills. 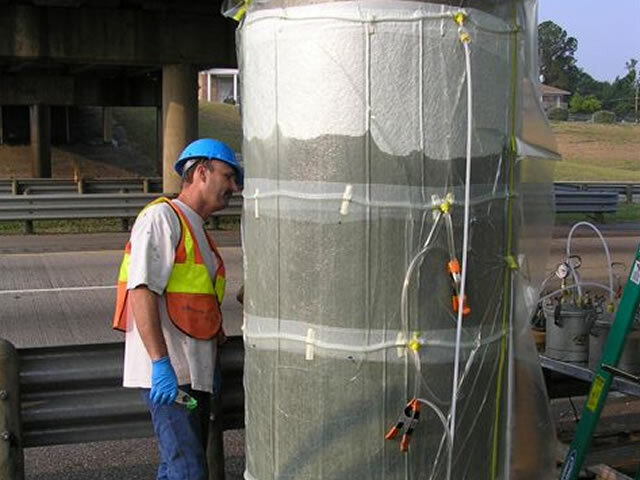 The replacement cost per pole can easily reach $10,000 when associated costs of traffic control, remounting equipment and other variables are considered. This composite wrapping technology is a proven system that was first installed in the Gulf region and withstood five major storms including Hurricane Katrina without a single failure. One subject, a class 3 utility pole was hollow from the ground level up due to decay. It was mended and is stronger now than the current fast growth poles that are used as replacements. The second generation of this technology incorporates single wall carbon nanotubes. Single-wall carbon nanotubes are very strong and resist fracture. When combined with other reinforcing materials they provide an extremely strong and durable protective matrix. Finally, the repair process is simple and fast. There is no need to take the service off line, and applying the wrap system only requires a two-man crew. 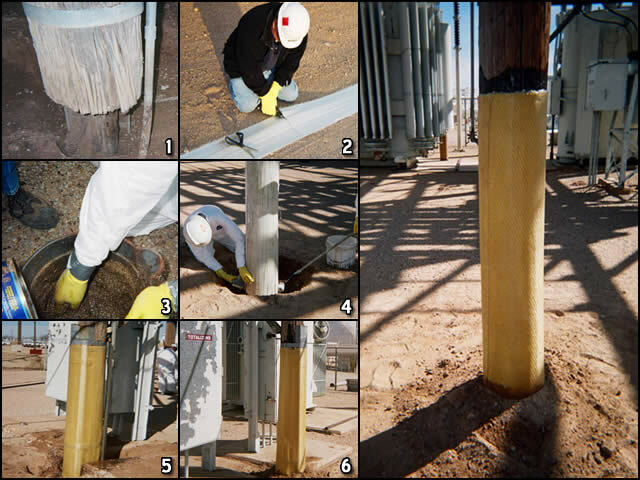 It makes it easy to repair limited-access poles, and eliminates all of the associated logistical problems with those difficult-access installations. The repair process is simple and fast. There is no need to take the service off line, and only needs a two man crew to apply the repair. Makes it easy to repair those limited access poles you dread having to work on. Once cured, the repair is stronger than the original pole. Click here for information on Infra-Gard PK-4200, our proprietary infrastructure coating and repair polymer that utilizes recycled tire technology. Copyright © 2019 The Princeton Keynes Group, Inc. All rights reserved.